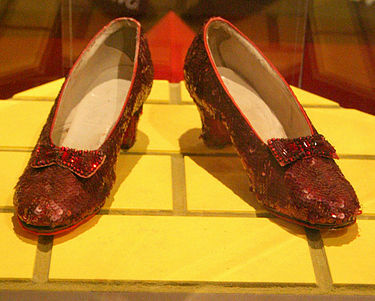 The ruby slippers that whisked Dorothy back to Kansas at the end of The Wizard of Oz, which for more than 30 years have been one of the most beloved items at the Smithsonian’s National Museum of Natural History, were crafted almost 80 years ago by the MGM prop department. Like most movie props, they weren’t built to last. Now, the frayed shoes aren’t even ruby-colored anymore — they’re a dull auburn. The shoes are the most recognizable prop for the beloved 1939 musical, their deep red hue dazzling audiences when the movie made its dramatic transition from black-and-white to Technicolor. They have been on display since anonymously donated to the museum in 1979. The Smithsonian have asked the public to help save the slippers, launching a Kickstarter campaign to raise $300,000. In addition to keeping the shoes’ color from deteriorating, the money will go toward a technologically advanced display case that will preserve them for future generations. The Smithsonian’s museums are federally funded, but the institution frequently solicits private and corporate contributions for major projects that its budget doesn’t cover. This is the Smithsonian’s second Kickstarter campaign. In 2015, the National Air and Space Museum raised $700,000 through the crowd-funding site to preserve the spacesuit that Neil Armstrong wore when he walked on the moon. If the Kickstarter campaign is successful, the slippers will be the second-most-researched item in the museum’s collection, behind the flag that inspired Francis Scott Key to write The Star-Spangled Banner. Best wishes over the efforts of the Smithsonian. This entry was posted on Tuesday, October 18th, 2016 at 5:26 pm	and is filed under Blog by Manny Pacheco. You can follow any comments to this post through the RSS 2.0 feed. Responses are currently closed, but you can trackback from your own site.